Crochet Beaded Wirework Instructions: $6. Includes easy basic method, how to add embellishments and changes. Illustrated section shows how to make links, clasps and findings with 20 gauge wire. Make earrings and bracelets using this method too! 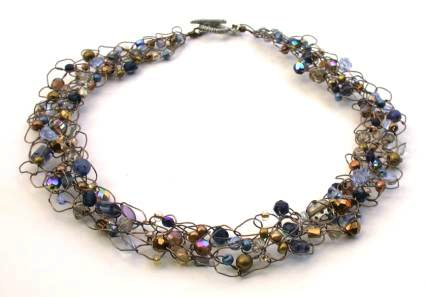 Note: crocheting this necklace requires a spool with at least 15 yards of 24 or 26 gauge wire. In addition to the instructions, order our color art wire, and bead mixes to create your own beaded wirework jewelry! Crochet Hook (G or H) $3 For beaded wire crochet jewelry. Round-tipped pliers $10. Essential tool for bead jewelry making. Chain-nose pliers $10. Essential for wirework jewelry making. Plato Shears $10. Good value wire cutters. Curved tip chain-nose pliers $10: Useful for wirework and crimping strung jewelry. Mini nylon-jawed wire smoother $10: Good for smoothing wire for easier bead stringing. Niobium Ear Wires for $2/pair. Niobium is a hypo-allergenic, nickel-free metal that comes in nine beautiful permanent colors. These ear wires match many wire colors and look great with your beaded wirework earrings. Niobium colors are: Blue-Green, Mint Green, Berry Pink, Bright Purple, Dark Blue, Peridot, Steel Blue, Gun Metal and Brown. New color available: Black (not shown). 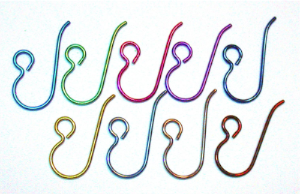 Assortment packages of six pairs available for $10 a package. 14K GF Ear Wires for $5/pair and Sterling Silver Ear Wires for $3/pair.